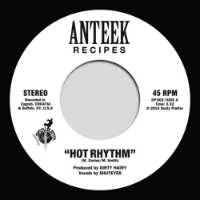 Anteek Recipes take it back like Robin Locksley on this limited gem. Hot Rhythm finds producer Dirty Hairy making your day by laying down a super smooth 80s dancefloor funk groove for MC Shuteyes to get lyrical on though the Buffalo NY emcee restrains himself from adopting the full retro rising and falling inflection of Sugarhill-era mic manipulation. Over on Little Stories Dirty Hairy’s all about the minimal chunkiness of the mid-nineties jazz-sampling boom-bap once the stock in trade of types like Artifacts and Blackalicious. Only 300 copies – and it’s been out a couple of weeks already. Don’t sleep!